Hello there. Okay, so maybe it's not exactly ennui that I'm feeling, or then again, perhaps it is (did Maine really just go from a blue to a red state?) or maybe it's just the two weeks of kids laid low by colds, but I just haven't been in a writing mood. Other than seeking home and artistic inspiration on the interwebs, I have avoided being on-line, as it's just too frustrating sad enraging disheartening otherwise. I did see this this morning. Basically, our three-way election for governor resulted in a republicanteabaggerpartylibertarian winning by about oh, 6%. Go Maine! (And the rest of the country? Head stomping, seriously?) Or maybe it's a bit of feeling like this? So in other things that make me go hmm...gender issues. A vast topic, one I've attempted to write about only to have my post sit there in its unpublished inferiority. Basically though, it would be great, like super peachy keen if as parents, we could stop imposing limitations and/or expectations on our children based on heterosexist, cis-privilege, heteronormative tropes. M'kay? Some things are awesome, however. Like my friend Jaisie's new tumblr. She also shares a passion for all things domestic (like matched sheet sets with the hems turned down properly), so naturally I'm loving her new blog. And, for eye candy's sake, one of my favorite rooms on the internet has gray painted floors and served as our initial inspiration. So that was a little taste of rainbow this week, at least. There's this bit of awesome from my friend, Tiff, too. I was reminded twice this week of why I love Maine libraries (and the librarians) so, so much. 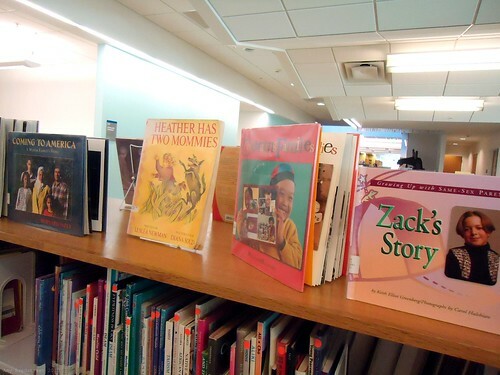 In the children's stacks at Portland Public Library. 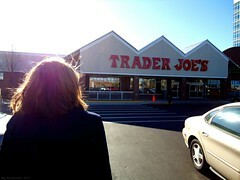 Oh, and there was our first trip to Maine's one and only, newly opened Trader Joe's. It's great to have another, budget-friendly option for groceries, certainly. A stop at Levinsky's with my best girl for $10 cozy Maine sweatshirts was pretty sweet, too. Both the kids have been living in them all week, pretty much. Speaking of Olivia, I promised to help her re-dye her hair today, so it's good-bye to the interwebs for a bit longer. Here's hoping that a weekend of connecting and being domestic renews my spirit for next week. (I should mention that Alex is at this moment, bottling up 4 1/2 gallons of blackberry wine.) Happy weekend to you All! I hear you-been very busy this week as well-getting deeper into photography learning:) Went to the Art Walk last night in Portland with my man. Such a venture for him! Next first Fri in Dec I say we all go-both families with the kids! Mari, what a fabulous idea! Now, about that...?